The New Zealand Sub-Antarctic Islands consists of the five southernmost groups of the New Zealand Outlying Islands. Most of the islands are located near the southernmost edge of the largely submerged continent centred on New Zealand called Zealandia. It sank after rifting away from Australia 60-85 million years ago and from Antarctica between 130 and 85 million years ago. It is 3,500,000 km2 in area, almost half the size of Australia and is unusually long and narrow. 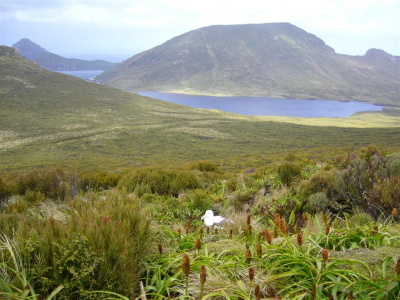 Slavery: The Auckland islands were briefly settled by Maoris from Chatham Island. They brought with them Moriori slaves. The Moriori had been the indigenous people of the Chathams who were enslaved by Maoris. "Sheep farming became popular and profitable and some Maori diversified into that. In 1842 one chief took nearly 30 slaves with him and his people and went to the Auckland Islands to live. The conditions were too harsh and the settlement was abandoned in 1854." Miocene: The Auckland, Campbell and Antipodes islands are primarily of recent volcanic origin. The first two are eroded volcanic domes created 10-15 million years ago. The western sides of all three groups have been eroded significantly, creating steep cliffs, while on the eastern sides lava flows and glaciers from the Pleistocene era (about 2 million years ago) have formed U-shaped valleys, fiords and harbours. The Antipodes volcano is the youngest and least eroded.